Description: Innovation, imagination and industrial design come together for a unique look. 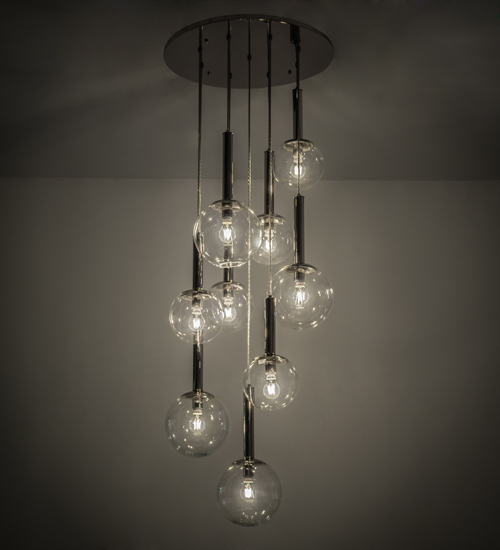 A captivating illuminating design that appears like pistons thrusting up and down, this cascading pendant displays nine Clear Glass globes that reveal Edison bulbs attached to Steel rods featured in a Polished Nickel finish. Nine 20-watt LEDs deliver quality ambient light, energy savings, minimal maintenance and long life. The pendant is perfect for foyers, lobbies, and other spaces with tall ceilings. Custom crafted in the USA, this fixture is available in custom designs, colors and sizes, plus dimmable lamping options. UL and cUL listed for damp and dry locations.